I feel that my best posts are created organically. They pop into my brain and make their way onto the screen in a free-flowing manner. They are not forced. Sometimes, I force myself to blog, and the resulting posts are not my best. This is when I fallback on my iPod and movie quotes. As you can see from the past few posts, I am in time of writer’s block. Nothing is coming to my mind, and I have a couple of options. I could force something that I really do not like. Of course, there is a third choice. I could drive myself crazy trying to think of a good idea and pretend it is free-flowing. For example, I could write about whether anyone would protest if this flag was flying over a state capitol. This is the paragraph on which the Supreme Court based its decision concerning gay marriage. The amendment was ratified in 1868. However, that process was fraught with problems. Most of the southern states refused to ratify it. I say most because Tennessee was the third state to pass the amendment, coming in behind Connecticut and New Hampshire. As a result, Congress, led by the Radical Republicans, passed the Reconstruction Acts. This meant that the remaining states of the old Confederacy had to pass the amendment in order to get back into the United States. Oh yeah, those were the states that fought under that flag further up in the post. 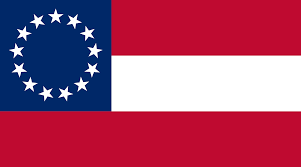 That was the first flag of the Confederate States of America. I bet a lot of people on both sides of the Confederate flag issue would not recognize it. Interestingly, Abraham Lincoln did not think the states had the legal right to secede and planned on getting them back in with a pledge of allegiance from a certain percentage of each state’s voters. I wonder what would have happened with the 14th Amendment if he had still been alive. However, that is alternative history, and history is tough enough without thinking about what might have happened. I could write about a song that I just downloaded, “Stole the Show” by Kygo. It also features Parson James. Anyway, it makes me think of how I used to handle relationships with women. However, that is too much information. Just know that I am happy to be married and have all of that behind me. On second thought, I will put it this way. I always envisioned myself as Burt Reynolds driving into the sunset at the end of Gator. In other words, I was an idiot. I could write about those things and a lot of other stuff that I have tried to cram into my mind. However, that will be forcing the issue, and I do not want to do that. It’s interesting how much legislation was required to enforce Constitutional Amendments passed in the 1870s. And we still don’t have equal pay. Or equal rights for everyone and probably never will. People have to change, not just the law. The 14th Amendment was blasted by suffragists because it did not address women. In fact, many think it sanctioned not providing women with equality. Well, I guess they had a valid point because we still don’t have equal pay for equal work. The issue of the legality of the secession is something that has always intrigued me. People had different opinions. I guess things haven’t changed all that much.